A horse is not just a horse. This supplement, compatible with any d20 campaign, allows you to customize a special mount for your character. Everything you need to know to create a legendary mount suitable to your character's heroic reputation is here. 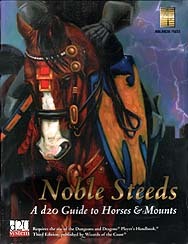 Special horse character classes, statistics by breed and type, a slew of special steed feats, new mount-oriented magic items, and information on exotic creatures such as the elephant and camel and magical ones like the Pegasus and Gryphon make this the ultimate book on your characters most faithful companion. Never ride a nameless "heavy warhorse" again. Now, your noble steed will be an important NPC and a part of your legend.